Travel sketch produced by Sigrid Rupp on an architectural study trip in Guanejuato, Mexico, November 15, 1988. Sigrid Lorenzen Rupp was born January 3, 1943, in Bremerhaven, Germany. She studied architecture at the University of California-Berkeley, received her California state license in 1971, and practiced for many years in the Bay Area. An ardent champion for women’s rights, Rupp stated that she became involved in women’s issues “…simply because I did not want there to be any [women's issues]. It seemed that the time for gender differences should be long over." She was a mentor to many women and minorities in the course of her practice encouraging and facilitating their entry into architecture.After retiring from architectural practice, Rupp became a prolific painter and traveler. Her watercolors primarily focused on California bay area landscapes and were featured in several local juried shows. She traveled extensively documenting her experiences in beautifully illustrated and annotated travel diaries. Permission to publish material from the Sigrid L. Rupp Architectural Collection must be obtained from Special Collections, Virginia Tech. Researchers wishing to cite this collection should include the following information: Sigrid L. Rupp Architectural Collection, Ms1997-006, Special Collections, Virginia Polytechnic Institute and State University, Blacksburg, Va.
Rupp, Sigrid L., “Travel sketch, Sigrid Rupp, Guanejuato, Mexico, November 15, 1988. 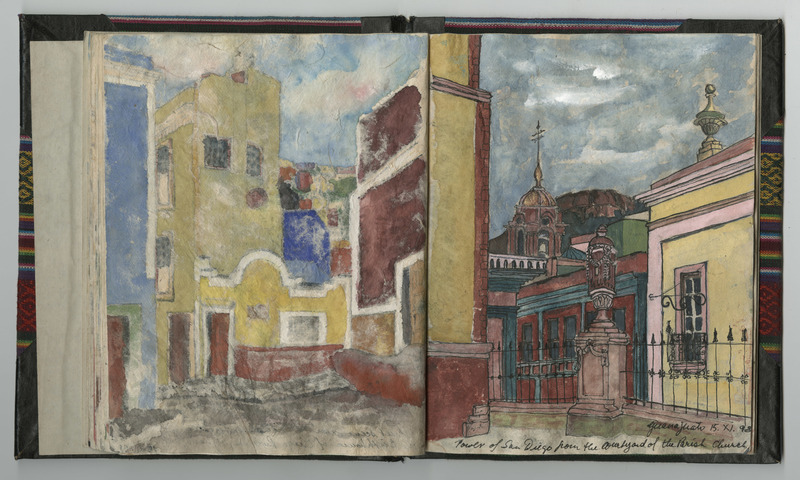 (Ms1997-006),” VT Special Collections Online, accessed April 23, 2019, http://digitalsc.lib.vt.edu/Ms1997-006/Ms1997_006_RuppSigrid_TravDiary_GuanejuatoMexico_1988_1115.